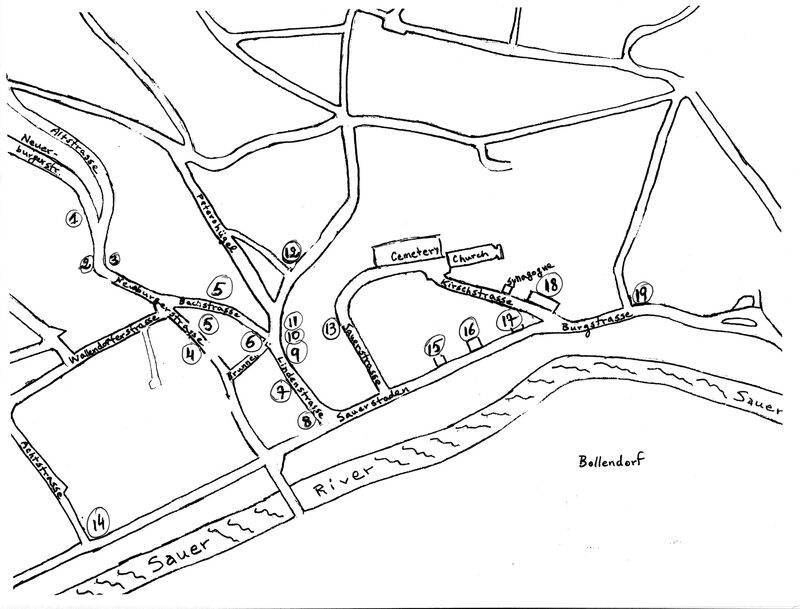 This map indicates the location of the homes of the Jews of Bollendorf, based on Marthe Levy Kristeller's recollections. The following descriptions were for the most part dictated to me by Marthe Levy Kristeller. Marthe was born in Bollendorf in 1913 and might well be the only native Bollendorf relative still living. I hope you will add any information or memory passed on to you by your parents or elders. Each number corresponds to a family and shows where they lived on the map, starting with the top left hand corner. 1- Neuerburger Strasse, Max Mayer’s house, where he lived with Hedy, his wife, and their 2 sons, Freddy and Kurt. It was one of the nicest and biggest houses in the village,standing back from the street, with a large entrance hall and a garden. It used to belong to a school teacher. Next to it lived a retired teacher, Marthe Speicher. Max’s house had 2 stories and a beautiful basement where jars of vegetables and preserves and other foodstuff were stored. 2- Neuerburger Strasse, Daniel Levy (Lepold’s Daniel) lived there, he was the son of Leopold Levy and of Helmine (Tante Mina) Sender. Daniel was married to Erna and had 2 children, Guenther and Ilse. Daniel was the only one to survive the war. He moved to Luxemburg and married Selma. 3- Across the street on Neuerburger Strasse lived Isaac Levy, the father of Delphine and Mahlchen and Albert. 4. Going down Neuerburger Strasse, we come to the house of Eugen Joseph. He was a cattle dealer. He and his wife left Bollendorf to join their daughterNelly who emigrated to Ascuncion, Paraguay with her husband Max Fraenkel. Max’s father had died and his mother, a widow had relatives in Paraguay. Max Fraenkel had been an apprentice baker with Daniel Levy in Bollendorf. The Joseph family also had a mentally-handicapped son who they had to leave behind because he could not get the necessary papers. It was a wrenching and dramatic decision, but he survived the war and deportation in Luxemburg and got married to Tilly. 5. Across the street on Neuerburger Strasse was the back entrance of Leopold Levy slaughterhouse, it communicated with the front of their house on Bach Strasse. 6. Close by on Bach Strasse lived Karl Mayer, Salomon Mayer’s brother. They were not well off, Karl was a “balzacer” (an advice giver) to Salomon. They had a fabric store and the store was not very busy. His son Siegfried was married to Delphine, Isaac Levy’s (Neuerburger Strasse) daughter. They had 3 children. They all lived together on Bach Strasse. 7. Going down towards the river, Bach Strasse becomes Linden Strasse where Daniel Levy, the baker, lived at No. 180 with his wife Melanie Cahen from Grosbous, Luxemburg and 2 daughters, Renée and Marthe. Daniel was born in 1880 on Sauerstaden. He was one of the sons of Marx and Caroline. He left to be an apprentice baker at the age of 14 in the bakery of Uncle Victor, a brother of Salomon’s who lived in Koenen, near Trier. He remained there as an apprentice until the age of 17 and then became a member (Compagnon) of the Bakers Guild. As a Compagnon, he traveled across all of Germany, working in different bakeries in many towns to improve his trade. He traveled for 14 years and at the age of 30, he came back to Bollendorf. He married Mela in 1911. The marriage was celebrated in the new synagogue of Bollendorf which had just been finished. The bakery was next to the house. Daniel Levy built the house on a piece of land given to him by his father. It used to be a garden. Daniel and his family were comfortable and they had no debts, Mela’s dowry had helped finish paying for the house. But there was a terrible inflation in the 20’s. “In the evening after closing the bakery, we didn’t count the money from the cash register for the day, we weighed the coins and made piles with the paper money; the next day, it was all worthless” told Marthe Levy. When flour was delivered, Daniel had to go the next day to Erang and Bitburg with a suitcase full of money, taking the bus in Irrel and then on by train, to go pay for the flour, otherwise, 8 days later, it had become worthless. Each city had its own money, called “Not geld” (money of need), because the State could not print the needed currency fast enough. The bakery was lucky because many of its customers worked in Luxemburg in the mines and were paid in francs, and that saved it from being ruined. In Germany, many people were bankrupt. Daniel Levy was a soldier during the WWI. He was sent to Russia (Preslikov), and he was also on the fronts at Chemin des Dames, in the Aisne department in France, and also spent a lot of time in the hospital (lazaret in german). He had major intestinal problems, and for many years after that, we made him oatmeal gruel. He participated in the big battles in Russia and France, in the infantery, and was decorated. At the beginning of the war, he had not been called because he was too short. But then, he was called. Mela couldn’t manage the bakery by herself and so the State had sent her a baker who had a limp and therefore was unfit for military duty. But eventually, he got called also. Mela was not able to keep the bakery open and therefore closed it. Selma from Hoppstaedten, Bella’s mother, came and stayed with them in Bollendorf for a while because her husband Albert had also been called. Then, Mela and her daughters Renee and Marthe went to Grosbous, Luxemburg, the Cahen family’s house, to help her parents; there was a lot of work, with all the children and the grandmother. Renee and Marthe went to the local school. For hebrew, they had teacher Königsberg who came from Bernkastel and also taught Bar Mitzwah preparation and other general classes. At the end of the war, Mela and her daughters returned to Bollendorf. The house was occupied by the French occupation forces, it was the officers mess hall. Mela spoke French and we lacked for nothing. During the whole length of the war, Mela would show Marthe her wedding picture so she wouldn’t forget what her father looked like. Daniel was vey handsome and well dressed. But when Daniel Levy came back, he had walked a long time, was dirty, unshaven and disgusting-looking, and I didn’t want to kiss him. 8. Walking down Lindenstrasse towards the Sauer, at the corner of Lindenstrasse and Sauerstaden, stands the Steinberger’s house. Tnate Marianne was the daughter of Eliezer (Lieser), a brother of Marx Levy and therefore first cousin to Daniel Levy the baker. Marianne had married Adolph Steinberger. They had 2 daughters, Irma and Erna. Adolph had scandalized the “kehilla” (jewish community) because he was a member of the municipal marching band, the “Musik Verein”, he played the drums, and when the Nazis came, the band played in town a piece called “Horst Vessel Lied”. One passage went like that: “Das Juden Blut, Von Messer spritzt, Dann geht’s noch mal so gut „ which means: „Jewish blood is poured by the knife, and then all goes well again”. Adolph said he had no choice, but in any case, he was rejected from the band anyway, and was very upset. They had a big store, with a traveling salesman who went to visit the customers and whose last name was Stern, but had tried several first names : Abraham, then Isidor and finally Heinz. He married Irma. Their house was very big and beautiful, with the store on the ground floor. The store was beautiful as well and had belonged to Lieser. Lieser was the most educated and the wealthiest of all of Marx Levy’s brothers. Adolph was very proud of the store where you could buy groceries at first, and then became a fabric store. Renee and Marthe Levy were friends with Marianne who had also gone off to school. The Steinberger were part of the local bourgoisie; they had a maid. Lieser had many children, one of his daughters had married a Sender from Soetern. The Sender children had emigrated to Israel. Adolph and Marianne and their daughter Erna were deported and killed, Irma Stern, her husband and 2 sons emigrated to Santo Domingo. 12. Further up on Lindenstrasse, on a corner, away from the Sauer lived Sara Joseph, a widow, her husband Max was killed during WW1. They were related to Eugen Joseph. They had 6 sons and 1 daughter Ida. The youngest son Benjamin never knew his father, who had died before he was born. Benjamin had emigrated to South Africa to settle down and find a wife, but he didn’t. He enlisted in the army and participated in the Italian campaign and in the battle of Monte Cassino. After the war, he turned to everyone in the family asking for help in finding a wife, but all the young eligible women turned him down, possibly because no one was willing to move to South Africa. He went back there and finally married. But he was not in good health and died young. 13. On Sauerstrasse, going down towards the river, stood the house of Marianne and Isidor Levy. Marianne was related to Mela Levy’s mother, she was her half-sister from Grosbous, Luxemburg. Isidor was “shochett” and cattle dealer. But he killed ritually only small animals like goats and calves. They had many children and were poor and all worked very hard. Alex died in the First World War. Bertha, Therese and Hanna left for the US, Paula, Martha and Sylvain went to Israel. Irma was the only one who stayed and she married Fritz Joseph from Luxemburg. She died not too long ago. 14., 15, 16, 17 Along the river, Sauerstaden is a beautiful tree-lined street. But some of its houses used to get flooded at certain times of the year. Daniel Levy lived at the corner of Achtstrasse and Sauerstaden, at the end of the village. He was the son of Abraham Levy who lived closer to the center on Sauerstaden, and the brother of Albert Levy (Bella Heppenheimer’s father). His daughter was Betty Golsdschmidt from London, who died very recently in March 2008. Continuing down Sauerstaden, past Sauerstrasse, we come to Karl Levy’s house, Gustav’s brother and Leopold’s and Hermine’s son. It was a very large family. Karl had married Erna, he was a cattle dealer and had one son. They were renters and had moved several times. Karl died before the war in unknown circumstances. Erna and her son were deported and killed. The house next to Karl’s on Sauerstaden belonged to Abraham Levy. His first wife was Brunette, a sister of Marx Levy. She was the mother of Albert Levy, of Berta and of Daniel. Brunette died in childbirth. and Abraham remarried Adele with whom he had a daughter who died young of diphteria. On her grave in Bollendorf, there was a cut tree to symbolize a life interrupted so early. They also had another daughter Johanna who left for America and married a Hermann who was a cattle dealer. Next to them was Marx Levy’s house on Sauerstaden, across the Sauer. He lived there with his wife Caroline Schoemann Levy. There was a street lined with chestnut trees next to the river. It was often flooded in their house when the river rose after heavy rains or the snow melting. The street was a bit higher than the house and the river, when it flooded, would go over the street. There was a wire mesh along the edge of the garden and when the river would draw back, the fish would stay stuck behind the mesh fence. They were still alive and you had to pick them up very fast from the ground. We would eat them. Marx was a cattle dealer and he died in 1917 from the flu during the great spanish flu epidemics. Many other people died from the flu, but no one else in the family. Caroline continued to cultivate her plots of land, there was an orchard, 3 grass fields and a garden. There was also a large field near the cemetery, but no one know what happened to it, nobody could or would take care of the land except for Caroline, and then their daughters Sophie and Lena. There were many apple trees, and the apple harvest plus the vegetables from the garden were the only source of income for Caroline and Sophie and Lena. They had no cow, but Daniel the baker did and he gave his mother and aunts milk, butter, cheese and of course, bread. And they were always invited for Schabbes meals. Sophie and Lena never married, probably because they were poor and had no dowry. Lena had worked as a salesperson in Duisburg, she lived with her sister Betty, Guenther’s mother. But, following an accident, her eardrum was pierced and she was deaf from one ear. She could no longer work, so she came back to Bollendorf to live with Caroline and Sophie. They had inherited from the land of their parents and lived from selling fruit and vegetables. They had a goat for the milk. Sophie would do a little sewing once in a while, but they had very meager resources. Theu were both deported and killed. 18. Salomon Mayer lived with his wife Babette Bonem, her mother Minette and their 8 children on Kirschstrasse, near the synagogue and on the way to the top of the hill where the church and the christian cemetery were. Salomon was a horse dealer, a “Pferdjud” as he was called locally. It was a more prestigious occupation than cattle dealer. Behind the house, Uncle Herman, Babette’s unmarried brother had a brick, tiles and construction materials business, Babette helped with the bookkeeping. She took over after he died. The house was large, with a big staircase on the outside in front, and 2 stories. On the ground floor, there were 2 living rooms, one for everyday, the “stuf”, and the other fancy for yontef, the dining room and the kitchen. In the fancy living room, there sat the phone, Number 11, still a rare occurence in those days. When it rang, Minette would stick her head in the door and say: “Wait, someone’s coming”. There was a hallway in the center of the house. The barn was next to the house, below was the garage and the storage area, on the way down to Sauerstaden, on the right, on a small street calle Bauer Strasse. That’s where the horse carriage (kutch) was stored. It had a folding roof. In the evening, when Salomon was returning from his trips to the countryside or to markets to buy and sell horses, he would pull the roof down, fall asleep and snore. The horse knew the way back. 19. Finally, the last house at the end of the village was Scholem's Levy's house on Burgstrasse, on the way to the Burg (a sort of mansion) and in the direction of Echternach. The name Scholem meant Salomon, to differentiate the family from the other Levy in Bollendorf. They had come from Aach, the little village near Trier where the other Levy had come from. Salomon's wife was Schanette (Janette). Salomon was a cattle dealer. His son would bicycle around in the countryside to sell notions like thread, buttons, fabrics and some clothing articles. They lived in a beautiful house at the corner, rather large, with a big kitchen and living room, and bedrooms upstairs. Schanette ran the store on the ground floor,selling sewing supplies, fabric, men's clothing. During Kristallnacht, the shop front window had been smashed. The next door neighbor, who was a teacher for the boy's classes, Mr. Werthessen had put, in the broken window, a photo of their three sons who had died as soldiers defending their country during WWI.